I started thinking of movie characters that used a bat, but not necessarily for baseball. Robert De Niro as Al Capone in Untouchables immediately came to mind with maybe the most memorable scene of the movie being where Capone beats a crime associate of his to death with a baseball bat at a dinner gathering. The crazy thing is that actually happened in 1928 after Capone found out he was being plotted on. Untouchable came out in 1987 so I chose the ‘87 Donruss baseball as the design inspiration. I utilized the “Rated Rookie” logo in place of a team logo. 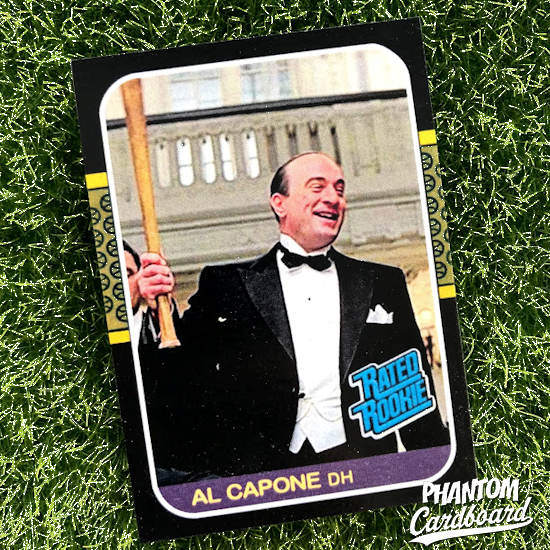 I listed Capone as a designated hitter as a tongue-in-cheek reference to him bashing brains in. Ah, that is really clever. I want one of these! Big fan of THE UNTOUCHABLES!